"Does it have a giraffe?" No, there isn't a giraffe at the Hope Zoo at the moment. If one comes, hopefully it will have a character like some of the engaging animals that are there now. Mr Alex the monkey had been the most engaging of all of the animals up to last year. When visitors stopped by his enclosure he started playing with his toys or swinging; being generally quite physical and active. It is always fun to visit him. Suki the spider monkey is also gregarious and perhaps I would give her the edge for being a little more interesting as she swings from her strong tail. Although he sometimes hardly moves, I definitely find the largest crocodile in the middle enclosure, I call him Snaps, quite interesting. Snaps is very aware of people around his enclosure and reacts in various ways. Sometimes he looks around and opens and closes his jaws; sometimes he shifts his position to get a better look. He created quite a sensation the day that I saw him catch a mango with his jaws and that is why I call him Snaps. During mating season he will try to climb the fence and get to the female in the adjoining enclosure. 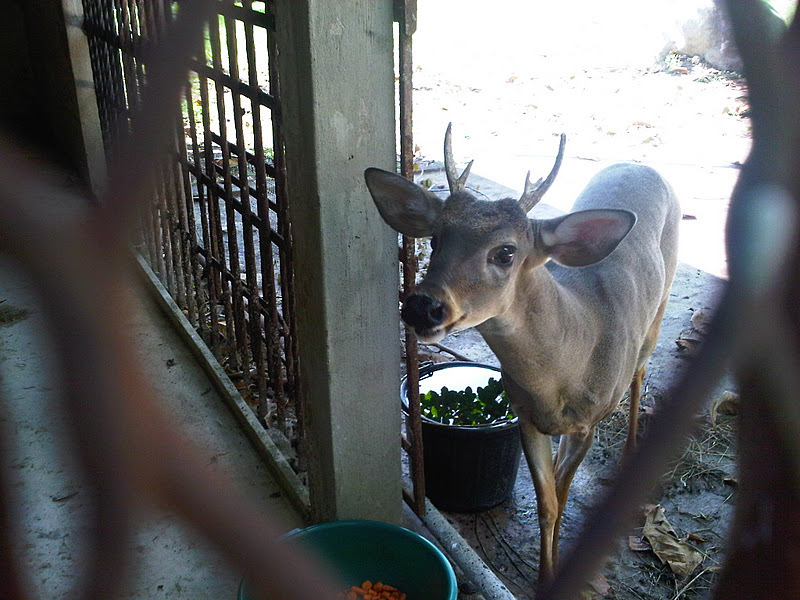 The zookeepers are very aware of that and go in and entice him away from the fence. Mr and Mrs Ostrich are also responsive. The Mr more than the Mrs as he does brilliant wing dances and also roars. The ostrich pair are ravenous and has eaten an unaware guest's cell phone! I am told. 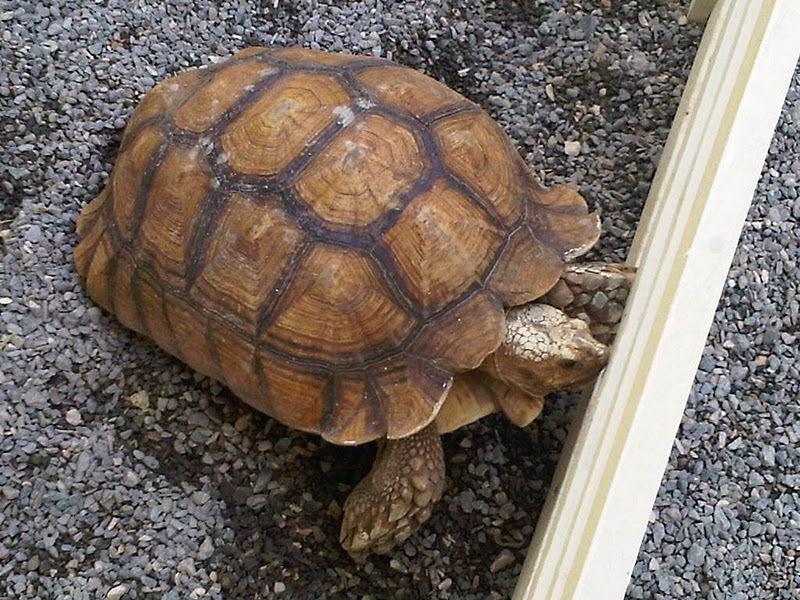 New to the zoo are the tortoises - slow moving, dull-coloured noiseless reptiles. The largest one, the grounds manager says, was transferred to the zoo from a residential garden where he just turned up one day and moved in. I call it Walker. 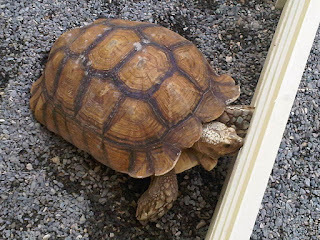 The operations manager says that the tortoise is slow but will not stop walking away. 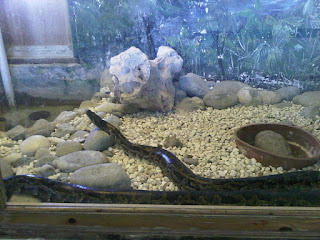 Walker has this trait and seems determined to escape from its enclosure - let's see if it succeeds. 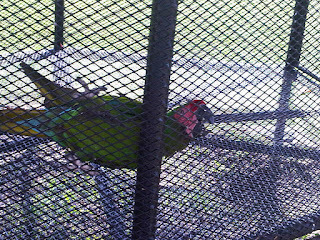 Hope Zoo has a range of eyecatching tropical birds. 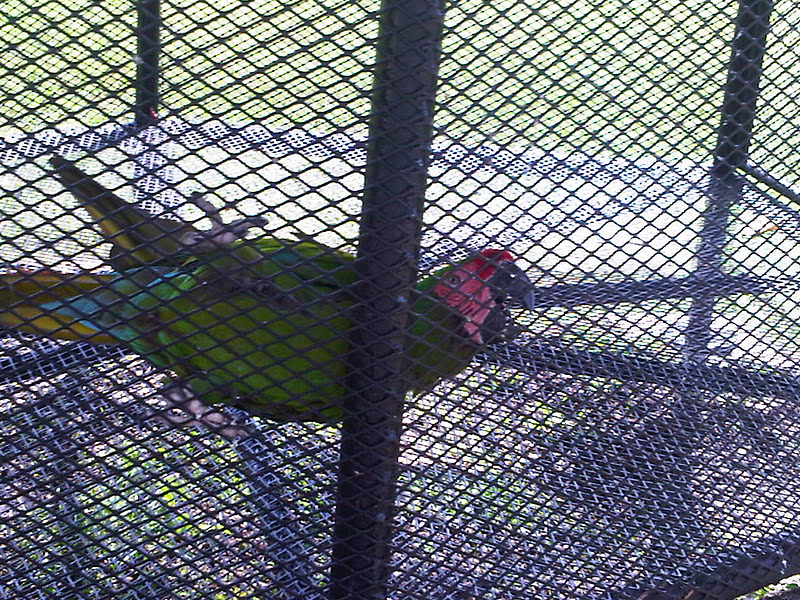 Cockatoos and Budgerigars from Australia; African Love Birds; flamingoes and Scarlet Ibis birds from the Caribbean and macaws and parrots from Central and South America. The positioning of the best talking parrot is a stroke of genius. Just as you are relaxed and leaving a loud "hello" may startle you. All of the animals can be enjoyed, even if they are resting or sleeping but these are the ones that I find to have the most engaging characters. 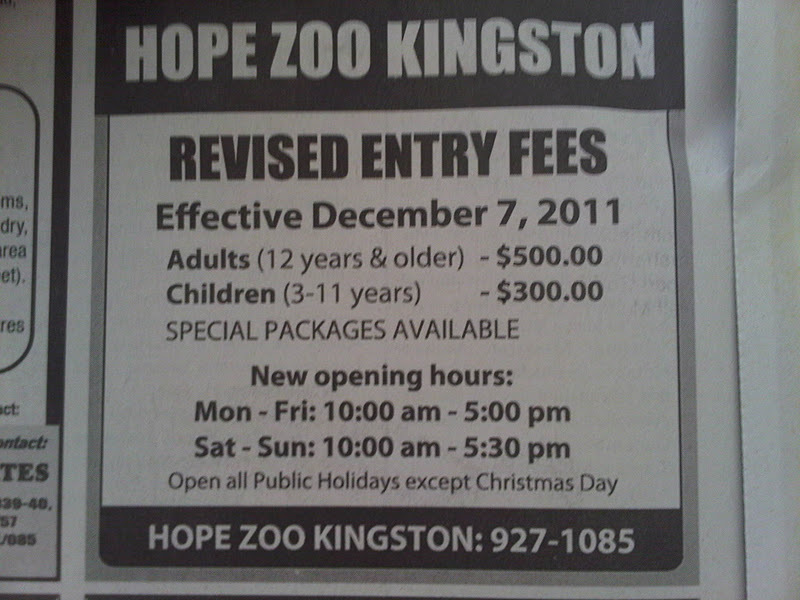 December 5, 2011 ad in the Daily Gleaner. 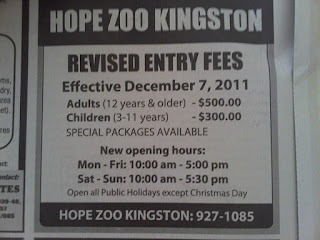 Labels: hope zoo gardens kingston jamaica, hope zoo kingston jamaica, What is at the Hope Zoo now?